Martin Faller, Deputy Regional Director, International Federation of Red Cross and Red Crescent Societies (IFRC). I have said it before and will no doubt say it again but in all my life I have never experienced the world in such a state of turmoil, overflowing it seems with hate, bigotry and violence. Refugees from Myanmar are pouring into Bangladesh, these people are living in terrible conditions they have no food, water or shelter. Charities are struggling to cope but there is not enough food for everyone. Queues of sick and injured people get longer despite the struggle by doctors and nurses to provide medical care. In short the situation is desperate. This is just heartbreaking, when are the international community going to do something to help these people. The world’s governments cannot stand by and do nothing to stop the genocide and continue to fail to provide urgent help to the Rohingyian people. Sometimes you feel so powerless in such situations and for the most part this is true of course, but there are things that we can do even if it is to only sign a petition or write to our MP. Myanmar’s military is using murder and mayhem to drive out hundreds of thousands of Rohingya Muslims. France’s President Emmanuel Macron is calling it genocide. But what the media rarely mentions is that governments all around the world are enabling it — allowing arms companies to sell and profit from ethnic cleansing and even providing military training. Please sign petition to All governments of the UN Stop all arms exports to Myanmar now. Deadly attacks on border posts in western Myanmar’s Rakhine state broke out, resulting in mass civilian casualties. Later, media reports emerged saying Myanmar security forces used disproportionate force and displaced thousands of Rohingya villagers, destroying homes with mortars and machine guns. Please sign and share all petitions. I know it does not seem much but every signature counts, it’s better than doing nothing. While it is time governments stepped up and did something, without charities and caring people the situation would be even more horrific. Ask him or her to raise the issue in Parliament, and to ask for the UK to commit funding to the relief effort. Save Rohingya Refugees – Volunteer TODAY! If you can afford to make a donation here are suggestions, you don’t have to give a huge amount. Why the hell can’t people just learn to live in peace regardless of race, creed, gender or any other perceived difference. We live in a beautiful world with enough even for the present huge population if only we could learn to get along without harming one another, other animals and the environment. Our lives are short and can be cut shorter at any time. 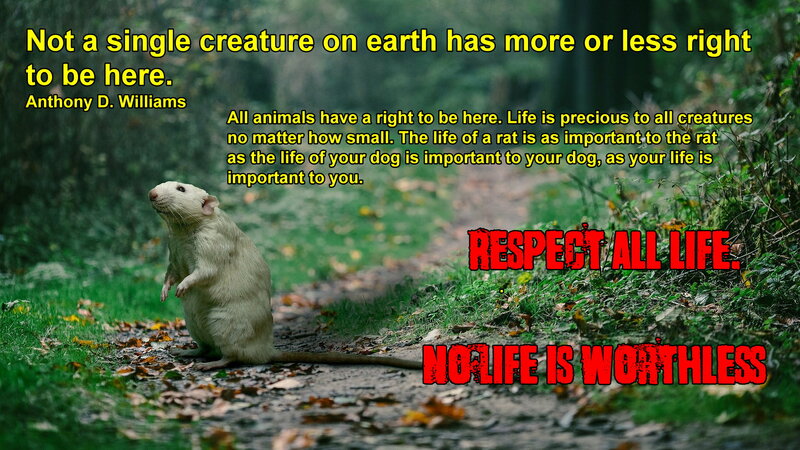 Life is precious to every creature that lives and we should respect that. I am sick of the violence, the hate, the greed, bigotry and intolerance in this world gone mad. Have things in our world become more insane, though perhaps with WW1 and WW2 there can be little comparison, however such comparisons do not make life any better for those who suffer. Countless millions of died unnecessarily because of hatred and greed and it not getting any better. Perhaps is it that we now have more access to what is happening in the world as a result of the internet without our dependence on the news media which is today biased and may even have been so in the past though few of us ever questioned this possibility, and even today many people take what they read in newspapers and see on TV as the truth without question. I don’t know what it going on in Myanmar except that people are suffering. Frankly there is so much turmoil in this world you just can’t keep up with all the whys and wherefores. All I know is people are suffering and it has to stop. Why are the Rohingya fleeing Burma? 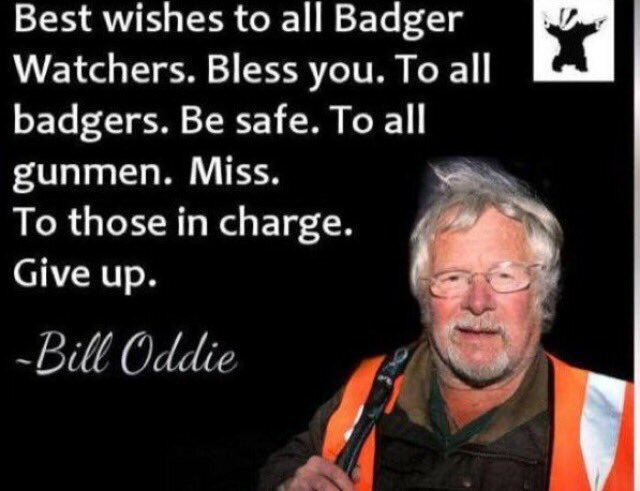 Please help stop the killing of 32,000 badgers who were once a protected species now the victims of mass slaughter in order for misguided people to consume a food they do not need after weaning, milk. Please read the following from VIVA and order campaign materials and take whatever action you can. If you can’t door drop or take your protest on the streets you can still share leaflets with friends and colleagues and share the campaign on the internet via social media. “Against science, common sense and basic decency the badger ‘cull’ in England is not only continuing it is being extended to new areas. Up to 33,500 badgers will be shot this autumn in a futile attempt to control TB in cattle (the vast majority of which is caused by bad farming practices), a massive rise from the 10,000 killed in 2016. We know this isn’t effective, humane or necessary. The dairy industry are the real culprits – and we want to let the public know that! Ditch milk, try any of the following plant based milk substitutes all can be used instead of Cow’s milk. My family and I use soya milk which is excellent for cooking , the results are the same as cow’s milk , also for cereals we use oat milk. Both soya and oat milk are sugar free or low in sugar and both come in different flavours such as chocolate or vanilla for an extra treat. 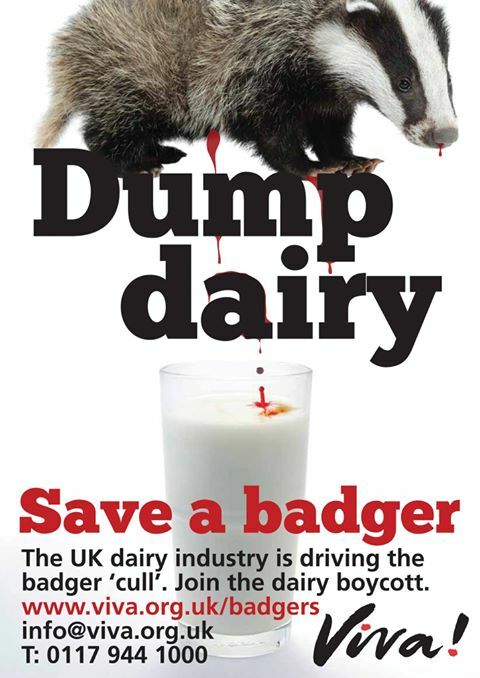 Please help VIVA’S campaign to save badgers and free cows from suffering in the dairy and meat industry. 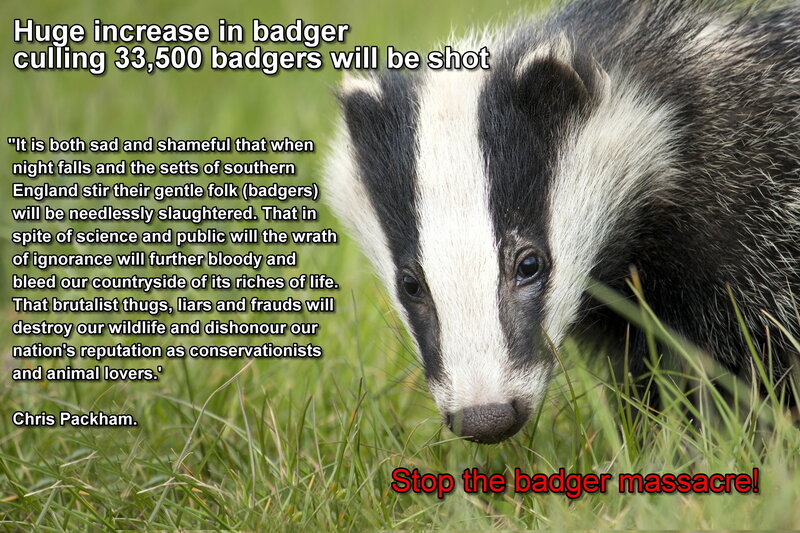 What gives the vile disgusting Tories the right to massacre 33,000 defenceless badgers who have as much right to exist as any other creature. A total of eleven new licenses have been issued. ethics -sadly an alien concept to the Tories – or plain and simple common decency. Up to 33,500 badgers will be shot this autumn in an attempt to control tuberculosis in cattle, a huge rise from the 10,000 killed in 2016. The government has announced that 11 new badger cull areas have been licensed, adding to the 10 already in place. Devon now has six badger culls under way, with Somerset and Wiltshire having three each, with others in Cheshire, Cornwall, Dorset, Gloucestershire and Herefordshire. As usual it’s all about money, they don’t give a damn about the cows. It is simply killing one animal, badgers, so that there are more of another animal, cows, to kill to satisfy the palates of meat eaters in order for them to eat a food that is not natural and eaten simply for pleasure, while making a profit of course. That’s what it is all about these days profit profit bloody profit at the expense of most people, other animals and the environment. I waited a couple of days before posting but so far there are no current petitions, at least none that I can find, relating directly to this new round of killings, if anyone knows of a petition please leave a link in the comments. Update Sept 16th – Thank you to Animalista Untamed for finding the following petition and information concerning the latest culling. Demand those responsible for the illegal snaring and shooting of badgers in the Peak District area of England are prosecuted. In any circumstance a letter or e-mail is helpful to leave the government in no doubt concerning public opinion. Labour have pledged to end the cull/killing but it might be an idea to write to them anyway and make your protest as it will show the level of public opposition to this disgusting massacre of animals who have a much right to inhabit the countryside which is their natural environment as we have. On Monday 11 September, the government released a report [pdf] showing that the so-called ‘Badger Cull’ hasn’t actually worked. But at exactly the same time, it also announced a sharp increase in the cull; which could mean up to [pdf p13-14] another 33,841 being killed (more than a 200% increase on 2016). All Animals Deserve to Live And to Live as Nature Intended. The earth is not ours to do with as we please, we share this earth with an estimated 8.7 million other species, the vast majority have not been identified – and cataloguing them all could take more than 1,000 years. Yes we share this earth, the earth is not ours and the other animals who inhabit this world are not here for our convenience, they do not exist for food, clothing, entertainment, experimentation or for use as labour. 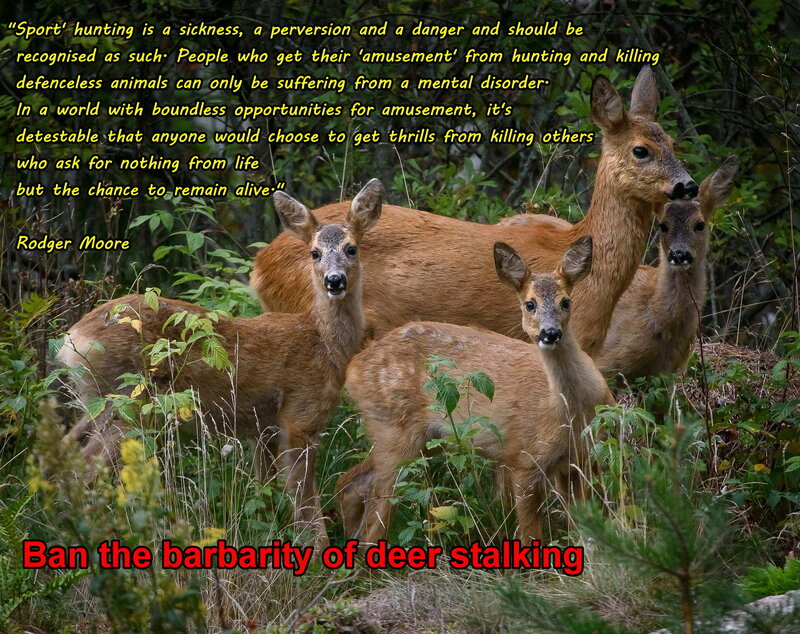 …it is absurd for them to say that the practise of flesh-eating is based on nature. For that man is not naturally carnivorous is, in the first place, obvious from the structure of his body. A mans frame is in no way similar to those creatures who were made for flesh-eating; he has no hooked beak or sharp nails or jagged teeth, no strong stomach or warmth of vital fluids able to digest and assimilate a heavy diet of flesh. It is from the very fact, the evenness of our teeth, the smallness of our mouths, the softness of our tongues, our possession of vital fluids too inert to digest meat that nature disavows our eating of flesh. If you declare that you are naturally designed for such a diet, than first kill for yourself what you want to eat. Do, it however, only through your own resources, unaided by cleaver or cudgel of any kind or axe. Rather, just as wolves and bears and lions themselves slay what they eat, so you are to fell an ox with your fangs or a boar with your jaws, or tear a lamb or hare in bits. Fall upon it and eat it still living, as animals do. But if you wait for what you eat to be dead, if you have qualms about enjoying the flesh while life is still present, why do you continue, contrary to nature, to eat what possesses life? Even when it is lifeless and dead, however, no one eats the flesh just as it is; men boil it and roast it, altering it by fire and drugs, recasting and diverting and smothering with countless condiments the taste of gore so that the palate may be deceived and accept what is foreign to it. If you eat meat consider the points that Plutarch made centuries ago, ask yourself what other animal cooks its food to make it edible, the fact that you need to cook meat is an indication that this food is not natural for humans. Animals have their own lives, their own natures and purposes. 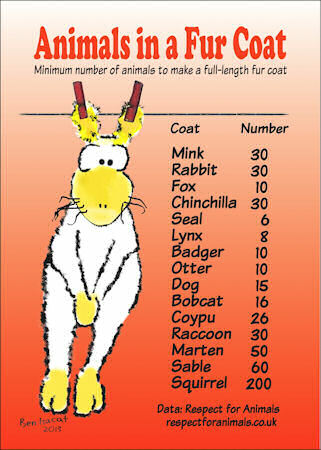 A rabbit, a mink or a fox, to name just a few of the unfortunate creatures to be killed to provide some humans with a fur coat, are not on this earth for that purpose. The fur of these animals belongs to the creature who was born with it. Way back in time the killing of animals for meat or fur was the only option available, but now no human on earth needs meat or fur or the wool of sheep. Yet the fur trade thrives throughout the world with millions of animals killed for their fur to satisfy human greed and fickle fashion. Each year, more than 1 billion rabbits and 50 million other animals — including foxes, seals, mink and dogs — are raised on fur farms or trapped in the wild and killed for their pelts. Meat is also a detriment to our environment, for example 51 percent or more of global greenhouse-gas emissions are caused by animal agriculture, eating meat causes pollution and uses up huge amounts of water to name just a few of the problems to our environment we ignore in order for wealthy people in western countries to eat meat. It breaks my heart knowing these two children are going to be killed and eaten. All animals deserve to live! Indeed it breaks your heart that those affectionate calves will soon be killed in order for you who eat meat, to consume a food that you do not need and is now merely a luxury, which not only causes the harm mentioned above but is for you the meat-eater a serious detriment to your health and well being. Also keep in mind that in many countries both dogs and cats are killed for meat. It was estimated in 2014 that worldwide, 25 million dogs are eaten each year by humans. In China alone roughly 20 million dogs are killed for consumption each year, making China the world’s largest consumer of dog meat. 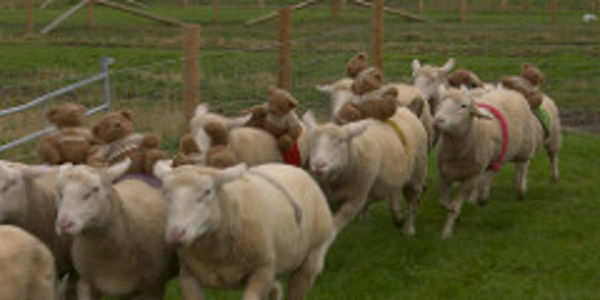 Whether it’s circuses, zoos, horse or dog racing or even here in the UK the bizarre but ever more popular sheep racing, hunting, shooting, fishing, the use of animals for entertainment is wrong. As Rodger Moore quoted above says there are now “boundless opportunities for amusement“, circuses and other animal entertainment including the obviously sickening pastime of blood sports are now anachronisms of a bygone age and are barbaric abuses of sentient beings, animals who have as much right to live their lives as they so please, as nature intended not as an adjunct to human activity. Cancel The Cruel Event of “Mutton Bustin'” at the National Western Stock Show & Rodeohttp://www.thepetitionsite.com/943/055/292/cancel-the-cruel-event-of-quotmutton-bustinquot-at-the-national-western-stock-show-denver/ Please sign and share. R. Frey, ‘The ethics of the search for benefits: Experimentation in medicine’, in Principles of Health Care Ethics, ed. by R. Gillon (Chichester: John Wiley, 1994), pp.1068-69. Nothing shames the human species as its use of helpless animals for experimentation. There is no excuse for this cruelty, no justification, whether it is testing a defenceless rabbit, guinea pig, or rat for cosmetic or medical purposes for which in addition to the aforementioned animals primates may be used, also dogs and cats in medical testing. Life is precious to any animal as your life is to you, what right have any human to assert that their life is more important than that of another animal. Right now, millions of mice, rats, rabbits, primates, cats, dogs, and other animals are locked inside barren cages in laboratories across the country. They languish in pain, ache with loneliness, and long to be free. Instead, all they can do is sit and wait in fear of the next terrifying and painful procedure that will be performed on them. The complete lack of environmental enrichment and the stress of their living situation cause some animals to develop neurotic types of behavior such as incessantly spinning in circles, rocking back and forth, pulling out their own fur, and even biting themselves. After enduring a life of pain, loneliness, and terror, almost all of them will be killed. Read the truth about the hideously cruel experiments inflicted on helpless animals and why they are unnecessary. My own opinion is simple, there is no excuse ever and no reason that can ever justify such cruelty because animals have as much right to their lives as we do , and moreover to live their lives without the negative interference of humans, if is after all their world also . This link has a wealth of quotations regarding the ethics of animal experiments such as the following, which in my opinion is one of the main reasons that still today animals suffer the agonies of experimentation. In the modern age there are few tasks now that need the labour of an animal, yet still animals are used in warfare, the enforcement of law, to provide transport, carry goods and so on. Such labour may cause exhaustion, often physical pain, for example if animals are used to carry heavy loads, which is still the case in many parts of the world today. Animals may often be made to comply by the use of whips and other violent forms of coercion. Animals used by law enforcement or the military are exposed to danger and death, remember unlike policemen or women or a soldier the animal has no choice. Not only is this physically exhausting and stressful but at the end of the animal’s useful life he or she is more than likely to be killed if they have not already died of exhaustion. During WW1 eight million working horses lost their lives, along with countless donkeys and mules. 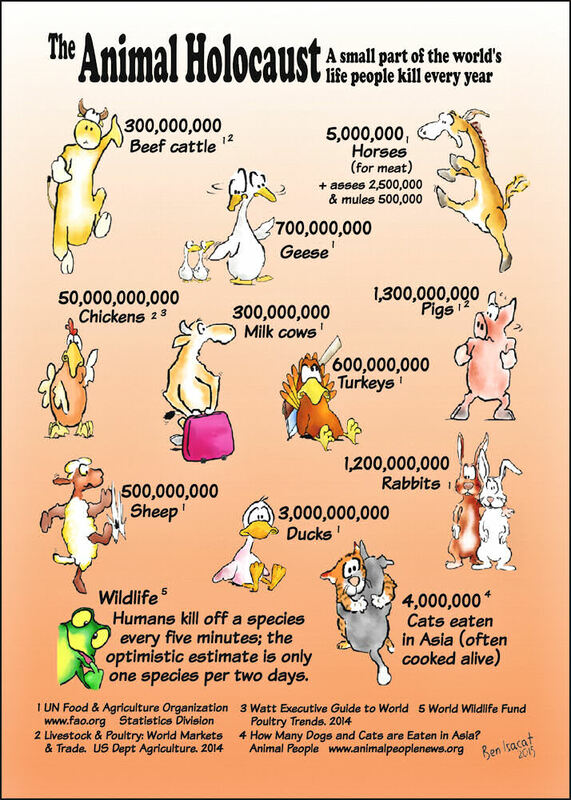 Also one million dogs and pigeons and other birds whose numbers are not known. During this war 16 million innocent animals with no say in or understanding of the matter were forced into war. During the the battle of Verdun in 1916 7,000 horses died in one day alone. Read more, also includes the deaths of animals affected by war as a result of their being abused in other ways such as trapped in zoos , used to detonate landmines. Animals used as Pets may well come under the category of animals used as entertainment but it a bit more complex and less clear cut than that as often these animals provide companionship. Regarding the word pet I prefer the term companion animal, but for ease of writing I will use the word pet which is often an endearment also used to imply fondness of our fellow humans, so for some of us it does not have the same negative connotations. In a perfect world no animal should be kept as a pet, and I wish this situation did not exist, but this is by no means an ideal world and the domestication of dogs and cats and other animals has progressed beyond the point of turning back. The opposition by many animal rights advocates including myself towards keeping a companion animal should not be considered as a call to release domesticated animals. Domesticated animals such as dogs, cats, rabbits and so on are now dependent on us for their survival, it would not be in the best interests of these animals to release them into the wild or let them lose in our streets where in both cases they would starve to death or come to other harm. Moreover no advocate of animal rights wishes to remove companion animals from their homes. However we have a moral duty to take responsible care of the animals that we take into our homes and you will find that many animal rights activists and supporters have companion animals or take into their homes rescued animals in need of care. The stance by many animal rights activists is that companion animals who are already here should live long, healthy lives, in as natural a way as is possible, cared for with love and respect by the humans who take them into their homes as their guardians rather than their owners. I would personally like to see the phasing out of confined animals as pets such as rabbits, guinea pigs, birds, rats, fish, reptiles and end deliberate breeding of such creatures as companion animals. These creatures still exist in the wild where they should remain to live the lives that nature intends. Having a pet or pets is a difficult subject and there are many conflicting opinions. I had three pet rabbits whom a miss very much. However all three came from rescue situations and needed homes. Whatever you decide regarding caring for a pet please adopt one from an animal rescue, if you live in the UK you can also go to the RSPCA who have many unwanted animals for adoption. Please do not buy from a pet store and most certainly not backstreet breeders as this perpetuates the trade in and breeding of animals. Please do not adopt an animal you cannot adequately care for or can afford, keep in mind vets fees can be considerable but a vital part of an animal’s well being and here in the UK a legal requirement. More advice is available in the above link. There are just so many ways that animals are used by humans, some less of a problem than others but I firmly believe that in general animals are better off in their own environments to live their own lives as nature intended and are most certainly not here to feed you, clothe you, entertain you or keep you company, unless they so desire, or for use as labour. Life is as important to an animal as our lives are to us , it is their world to and each and every creature has a right to be here regardless of how useful or otherwise they are to humans. Karen Szewc and John Updegraff began breeding Tibetan Mastiffs to protect their sheep from predators at their home in Rouge River, Oregon, United States. But they bark too much when left alone for long periods of time, according to Updegraff’s neighbors, Debra and Dale Krein. Then, they decided to sue them. This Wednesday an Oregon appeals court consisting of the judges Joel DeVore, Chris Garrett and Bronson James agreed that the owners must surgically damage or remove the vocal cords of their dogs in order to reduce their ability to vocalize, in a procedure known as “ventriculocordectomy”, “debarking” or “devocalization”. Debarking is controversial because barking is normal behavior for a dog and an important way of communicating with those around them. The damage or mutilation of the vocal cords can result in a dog experiencing permanent distress and, consequently, psychological harm, by their lack of ability to sound an appropriate warning as they feel necessary.